When cleaning up photos in Photoshop CC, large challenges sometime require drastic measures, such as duplicate layers and layer masks. Take a look at the following figure. At the top left, you see the “before” photo: at the top right, the “after” image. Below are images from three key steps in the process. Decide what needs to go and how best to cover it. In this case, the young man is no longer welcome in the group photo. The easiest way to remove him (without using scissors and leaving an empty hole) is to move the two young women on the right over to the left. Make a selection of the area that you’ll use to cover. A large rectangular selection is used, which included everything to the right of the young man. Copy to a new layer. Use the keyboard shortcut Command+J/Ctrl+J to copy the selection to a new layer. Use the Move tool to slide the new layer over the top of the area you want to remove. Click the Add Layer Mask button at the bottom of the Layers panel and then paint with black in the layer mask to hide areas of the upper layer. As you can see in the lower left in the figure, the upper layer covers areas of the lower layer that need to show (such as the man’s head), creating an unnatural shadow pattern. The layer mask in the lower-center image exposes as much of the lower layer as possible, leaving the upper layer visible only where necessary to show the two young women and their shadows as well as to hide the people on the lower layer. Look for and adjust anomalies. In the lower center of the figure, you see that one woman’s foot should be in the man’s shadow. A new layer is added, and a selection is made of the area that should be in shadow, which is filled with the color of the toes that are already in shadow. Glancing again at the lower-center image in the figure, you see the area that needs to be cropped, off to the right. 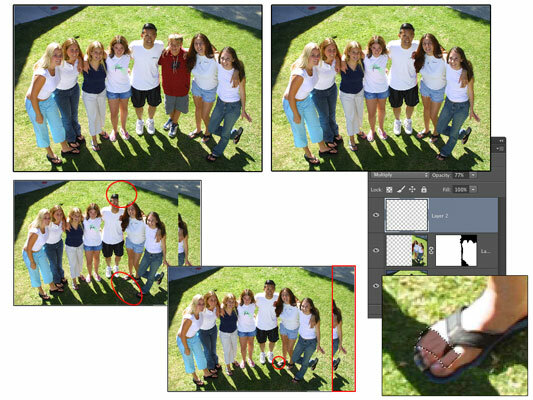 Using a rectangular selection of everything you want to save and the Image→Crop command, the alteration is complete.